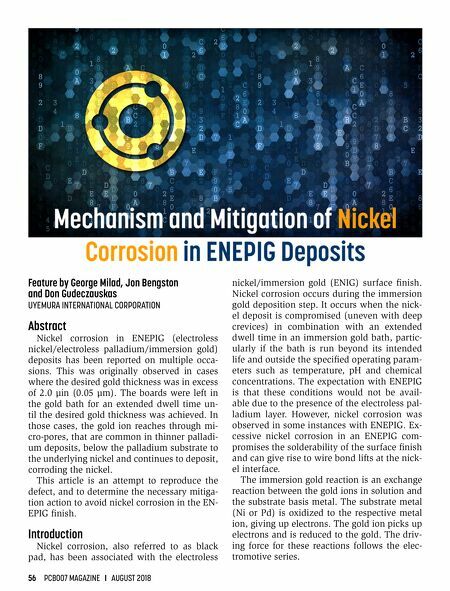 56 PCB007 MAGAZINE I AUGUST 2018 Feature by George Milad, Jon Bengston and Don Gudeczauskas UYEMURA INTERNATIONAL CORPORATION Abstract Nickel corrosion in ENEPIG (electroless nickel/electroless palladium/immersion gold) deposits has been reported on multiple occa- sions. This was originally observed in cases where the desired gold thickness was in excess of 2.0 µin (0.05 µm). The boards were left in the gold bath for an extended dwell time un- til the desired gold thickness was achieved. In those cases, the gold ion reaches through mi- cro-pores, that are common in thinner palladi- um deposits, below the palladium substrate to the underlying nickel and continues to deposit, corroding the nickel. This article is an attempt to reproduce the defect, and to determine the necessary mitiga- tion action to avoid nickel corrosion in the EN- EPIG finish. Introduction Nickel corrosion, also referred to as black pad, has been associated with the electroless nickel/immersion gold (ENIG) surface finish. Nickel corrosion occurs during the immersion gold deposition step. It occurs when the nick - el deposit is compromised (uneven with deep crevices) in combination with an extended dwell time in an immersion gold bath, partic - ularly if the bath is run beyond its intended life and outside the specified operating param- eters such as temperature, pH and chemical concentrations. 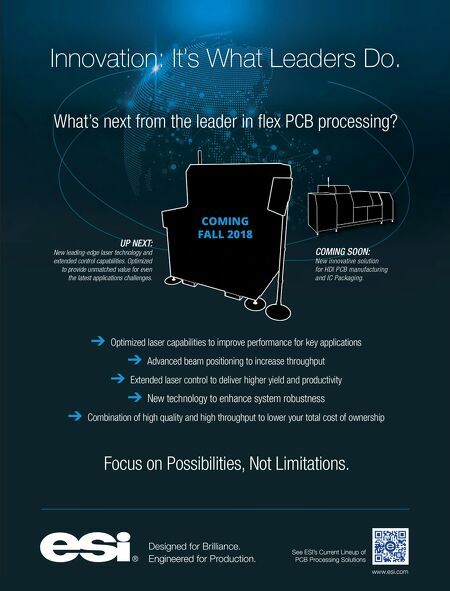 The expectation with ENEPIG is that these conditions would not be avail - able due to the presence of the electroless pal- ladium layer. However, nickel corrosion was observed in some instances with ENEPIG. Ex- cessive nickel corrosion in an ENEPIG com- promises the solderability of the surface finish and can give rise to wire bond lifts at the nick- el interface. The immersion gold reaction is an exchange reaction between the gold ions in solution and the substrate basis metal. The substrate metal (Ni or Pd) is oxidized to the respective metal ion, giving up electrons. The gold ion picks up electrons and is reduced to the gold. The driv- ing force for these reactions follows the elec- tromotive series.